Last Saturday night, or actually the early hours of Sunday, 1st February, I was up watching the Men’s final of the Australian Open – a match-up between the two best tennis players in the world: Rafael Nadal and Roger Federer. The world rankings say that Nadal is #1 and Federer is #2, and if the current form is any indication, Nadal is bound to catch up and overhaul the career Grand Slam mark that Federer sets. But for as long as Federer is an active player, he will remain my favourite. Being a right-handed player with a single-fisted game myself, albeit of phenomenally less talent, I love watching the beauty of his play – so effortless, so graceful, yet so fascinatingly dominating. He is the reason that I resumed playing tennis after a 15-year hiatus. Which is why I was really sad on Sunday morning. These two opponents have provided 3 thrilling encounters, all in the finals of grand slams – 2007 Wimbledon, 2008 Wimbledon and 2009 Australian Open. All were 5-setters, and the first one resulted in a victory for Federer, while the other two had Nadal triumphing. The two defeats, though worthy of the finals of Grand Slams, left me feeling very sorry for Federer. Here was a person on the cusp of history on both occasions – about to set an open-era record by winning his 6th successive Wimbledon in 2008 and his record equalling 14th Grand Slam at the Australian Open in 2009. Both the times Nadal halted his quest. When asked to speak at the award ceremony of the Australian Open, he broke down and I guess most people could feel his pain. Sheesh – someone who has reached at least the semi-finals of every grand slam since 2004 and the finals of all but two of them, who has missed winning a calendar grand slam on two occasions, being thwarted by another genius surely must hurt. Particularly since Federer’s problems against Nadal are more in the mind rather than the ability. Throughout the Australian Open Federer had a first serve percentage of around 70%, but in the final it dropped to 51%. It is as though his form deserts him while playing Nadal. It was quite different in Wimbledon 2007, when the match kept see-sawing till Federer hit his groove in the fifth set. Nadal’s level of play remained the same, but Federer was sensationally sublime, as he is with every opponent other than Nadal. The result was that Federer convincingly won the last set. If only Federer can do that more often against Nadal! Till then I feel it is difficult for Federer to cross the number 14. At the end of the day the greatest gesture of the Australian Open came from Nadal, when he put his arm around a distraught Federer to console him. The best moments in sport are highlighted by the victor commiserating with the vanquished, when the vanquished could well have won an engaging battle. 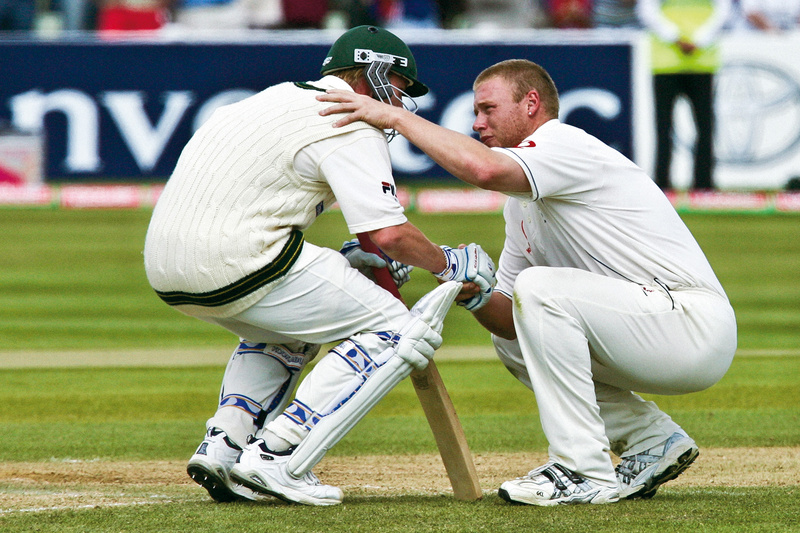 Take a bow, Federer & Nadal at AO 2009, you join Andrew Flintoff consoling Brett Lee at Edgbaston in 2005 and Brett Lee applauding Sachin Tendulkar at Adelaide in January 2008 as my favourite sporting moments!